This week's theme is: FALL projects and quilts. Crafting, sewing, recipes, give-aways and more...is exactly what you'll find at Carole's From My Carolina Home Blog all through October!! I tease her through email, that every time I stop by and visit her Jubilee posts that I wish I had more hours in the day to join in and do everything! To read her overall Autumn Jubilee announcement that includes sponsors and a general overview of the event, click HERE. And to join her Fall QAL that just started a few days ago, click right HERE. 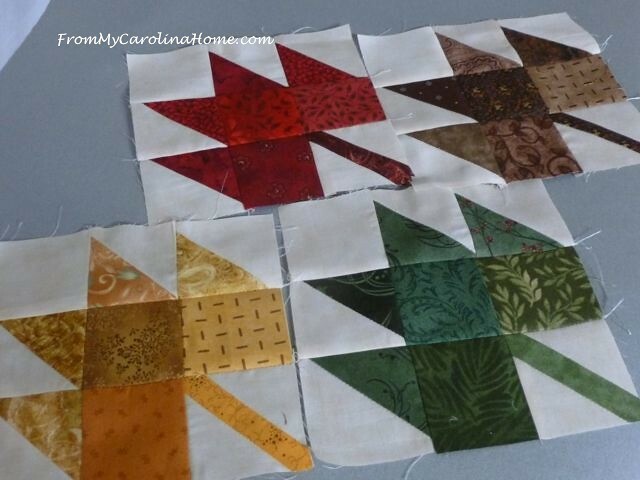 These are Carole's leaves and I would love to make a Fall lap quilt following her QAL. I'm hoping to start mine this Sunday! Those leaves would make a pretty lap quilt, for sure. Thank you for hosting and have a good week! Looking forward to seeing your autumn leaves. As I see more of these leaves pop up around blogs, I am so tempted. I love your autumn leaves!! They look great!! Very pretty leaves. I will be strong and not start another project. I will just have to enjoy watching yours! I love maple leaves. I have a few blocks here and need to do something with them.